Rice noodles, a typical Yunnan snack, are prepared with high-quality rice. Thin, long and soft, rice noodles are especially delicious. Crossing-the-Bridge Rice Noodles are meticulously prepared with broth, sliced meat and seasonings. 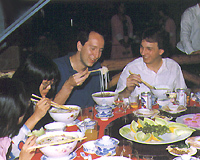 Crossing-the-Bridge Rice Noodles originated from Mengzi County in south Yunnan, with a history of more than 100 years. Legend has it that a scholar studied hard everyday, preparing for the imperial examination. His wife often delivered rice noodles to his study. Finally the scholar passed the examination and became No.l Scholar. As his wife must cross a bridge when delivering food to him, the scholar named it "Crossing the-Bridge Rice Noodles", which later became very popular. With breathtaking scenery, Dali Bai Autonomous Prefecture of Yunnan is known as Oriental Hawaii. Dali Earthen Pot Fish is a traditional dish peculiar to the places where the Bai people live in a compact community, delicious, refreshing and nutritious. Sandao Tea originally was a tea drinking courtesy of King Nanzhao, a local regime in Yunnan Province in the 8th-10th century. This courtesy was later introduced to common folks. Now Sandao Tea is a custom of the Bai people in Dali to entertain guests and friends. Sandao Tea firstly tastes bitter, then sweet and finally has aftertaste. When drinking tea, tourists can also appreciate folk songs and dances of the Bai people. Xuanwei City in Qujing Prefecture, Yunnan Province teems with ham, known as Xuanwei ham, which enjoys a high reputation both at home and abroad. In 1915 Xuanwei ham won a gold medal at the Panama International Fair. In the shape of pipa (a plucked string instrument with a fretted fingerboard), Xuanwei ham has thin skin, thick meat, a bright color and a strong aroma. Thanks to its high quality, Xuanwei ham is also known as "Yunnan ham." 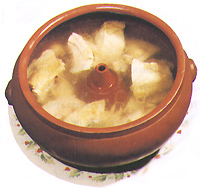 As a high-quality dish of Yunnan Province, Steam-Pot Chicken is prepared in a unique way, featuring tender chicken and delicious and nutritious soup. As the most famous dish of Yunnan Cuisine, Whole Sheep Banquet is prepared with different ingredients and methods as compared with those of Xinjiang and Inner Mongolia. 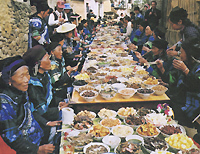 Long Street Banquet Long Street Banquet originated from Yuanyang County, Honghe Prefecture, Yunnan Province. In February every year, local people would celebrate "Angmatu" in accordance with the customs of the Ham people. During the festival more than 300 families in the village would present banquet of 300-odd tables. Villagers and tourists from other places may sit down to taste Ham food while enjoying songs and dances by the Ham people, men and women, elderly and young. This local custom is called Long Street Banquet, or Long Dragon Banquet. All tourists will be treated as honored guests.